One day, a lion was sleeping in his den. Seeing the lion asleep, a naughty little mouse, ran up his tail, onto his back and up his mane and danced and jumped on his head. The lion woke up. The lion looked at the tiny creature and laughed. ‘You will save my life? That is great,’ he said scornfully. 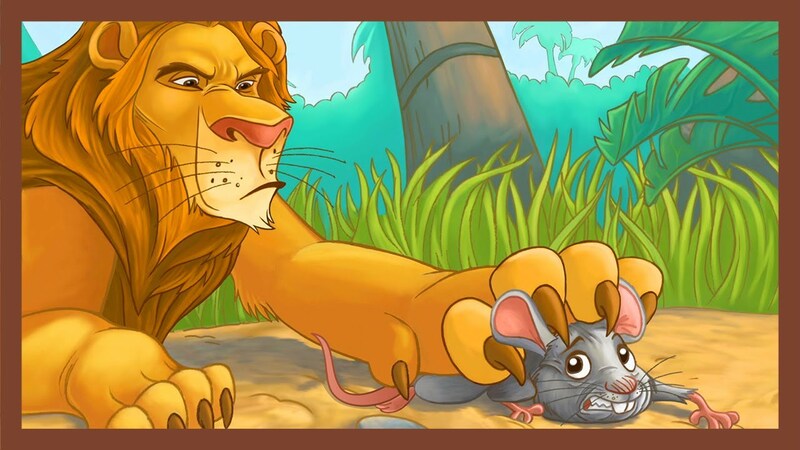 ‘But since you have made me laugh with your jokes, I shall let you go.’ And the lion opened his claws and let the mouse go free. ‘Oh thank you, your majesty,’ squeaked the mouse. He then scurried away as fast as he could. A few days later the lion got caught in a hunter’s net. He struggled with all his might, but he couldn’t come out of the net. He let out a roar of anger that shook the forest. Every animal, including the tiny mouse, heard the roar. ‘It was my turn to help you, Sir,’ replied the mouse.